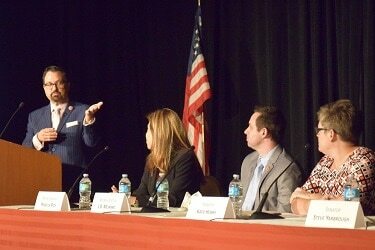 Republican and Democratic legislative leaders from the Arizona House and Senate shared their insights into the proposals, processes and passed bills that made Arizona’s 2017 session a success during the Greater Phoenix Chamber of Commerce 23rd Annual Legislative Wrap-Up Breakfast on May 31. Mesnard, who completed his first session as House speaker, complimented his colleagues and the 25 freshman House members for working together and making his challenging job easier, even though he had to be “in five places at once” sometimes. The new speaker highlighted bills to reform the state’s initiative process and expand the state’s Empowerment Scholarship Account (ESA) as accomplishments of which he’s particularly proud. Arizona House Speaker J.D. 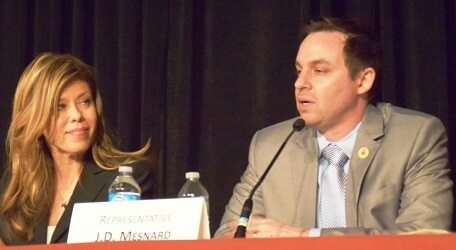 Mesnard answers a question while House Minority Leader Rebecca Rios looks on. (Photo by Danny Imes/GPCC). 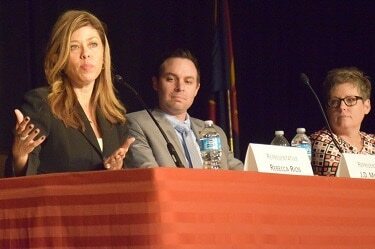 On education, the speaker has concerns about allocating money to schools blindly, given that Arizona teacher pay ranks near the bottom among states even after Proposition 301, which was largely dedicated to teacher pay, was passed by voters in 2000. House Democratic Leader Rios complimented the “groundswell of outside participation” during this year’s legislative session and She identified education funding as a “missed opportunity” during the discussion while adding that government spending should be increasingly prioritized toward education, potentially at the expense of some her GOP colleagues’ other spending priorities. Senate Democratic Leader Hobbs complimented the work of her Democratic colleagues for sticking together during the session and “playing defense alot.” She wished that the Legislature would have worked on legislation providing non-discrimination protections to the LGBT community. President Yarbrough lamented lightly that his measure to extend state senators’ terms didn’t make it, but was happy that two bills relating to telecommunications passed. He also highlighted the importance of education and the economy. House Minority Leader Rebecca Rios answers a question while House Speaker J.D. Mesnard looks on. (Photo by Danny Imes/GPCC). SRP’s Jason Baran followed the panel discussion by presenting the annual Issue Champion award to Republican Rep. Vince Leach of SaddleBrooke, who was a major early supporter of initiative reform, one of the Chamber’s 2017 priorities. The bill, HB2404, makes common sense reforms to the initiative process while ensuring much-needed initiative system integrity by removing the incentive for fraud. Thanks to all who attended and see you next year!